I believe that to be effective, people must love their work. I love being a librarian. While most see this as an old-fashioned, stereotyped profession, I disagree. I see librarianship as the most adaptable profession imaginable. In December I retired from the school library position I had held for 21 years. I truly loved the job, the people and especially the children. Over the course of the 21 years, my school transformed from baseband Internet to a T3 line with wifi connections. Our PCs moved from dumb clients to 1:1 Chromebooks for each child in grades three through five, with other grades being added in coming years. The philosophy of the library moved through two versions of Information Power to Standards for the 21st Century Learner. 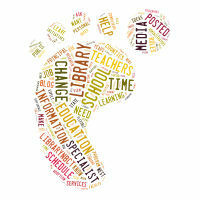 Collaboration, tech integration and information literacy skills became the focus of the library program. So many federal mandates came and went. There were truly more changes than I can remember. It was only for health reasons that I retired. Now I serve as a part-time program outreach librarian at a public library. My collaborations take me out into the community to spread library resources to everyone possible. It is exciting to make new contacts and to help people. There are so many things going on in all kinds of libraries today. One can never be bored. I have so many projects on the burner now that I could work 72 hours a week and not be close to running out of things to do. It is all about offering more to the public and making sure that all members of the community have the opportunity to benefit from library services. I love my job! When I worked in the schools, there were those who felt calling me a librarian was an insult. Nothing could be further from the truth. Librarians throughout history have dealt and embraced every change that has come at them. I think change is exciting. Bring it on!